Ø Aneka is a Sanskrit word meaning “many into one”. Ø This signifies ability to support multiple runtime environments and multiple programming models with one middleware platform. Ø In terms of cloud computing Aneka is a platform and a framework for developing distributed applications on the cloud. Ø Aneka provides developers with a rich set of APIs. Ø Constituted by a set of nodes with restricted access. Ø Aneka based computing cloud is a collection of physical & virtualized resources connected through a network, which are either the internet or a private intranet. Ø In the Aneka “Hosting” concept are available. 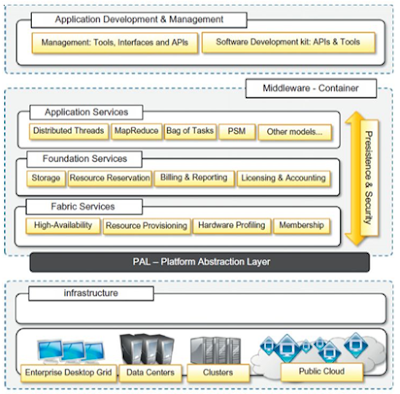 Ø In which the services are broken up into fabric, foundation, and execution services. Ø Aneka is a market oriented cloud development & management platform with rapid application development and workload distribution capabilities. Ø It is market oriented since it allow you to build, schedule, provision & monitor results using pricing, accounting, QoS/SLA services in private or public network. Ø Aneka is a workload distribution & management platform that accelerates applications in Microsoft .Net framework environments. Aneka provides APIs and tools that enable applications to be virtualized over a heterogeneous network. - Task Model for batch and legacy applications. - Thread Model for applications that use object oriented thread. - Map Reduce Model for data intensive applications like data mining or analytics. - Design Explorer for Parameter Sweep applications. Built on-top of task model with no additional requirements for programming. - Work Flow applications. Built on-top of task model with some additional requirements for programming. - PC Grids (also called Enterprise Grids). - Public and/or private networks. - Virtual Machine or Physical. Use APIs and Tools to build new applications or enable existing applications over different Run-time environments. - Faster time to value. - Simplicity in developing applications on cloud. - Rapid deployment tools & framework.